Swiss File Knife-Command line multi function tool. 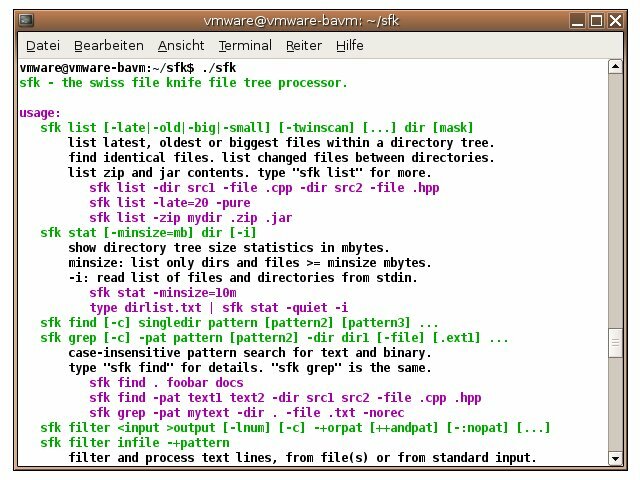 Find and extract text in files, dir tree size, filter and replace text, instant ftp server, http server for easy file transfer, find duplicate files, split and join files, md5 lists, run a command on all files, detab, hexdump, tcpdump, color text, convert CR/LF, list all .zip .jar .tar.gz .bz2 contents. No Installation, Portable Executable. Instant Use on Windows and Linux. Also compiles on Mac. ...... zip, .jar, .tar.gz and .tar.bz2 file contents. Read more on that here. You may place questions in the sfk forums, or submit a tracker request. For software download sites: the SFK PAD file is available here. SFK binaries for Apple Macintosh are available here: i686 powerpc - but these are experimental and unsupported. SFK Extended Edition is not available for Macintosh. Qweas is providing links to Swiss File Knife 1.6.3 as a courtesy, and makes no representations regarding Swiss File Knife or any other applications or any information related thereto. Any questions, complaints or claims regarding this application Swiss File Knife 1.6.3 must be directed to the appropriate software vendor. You may click the publisher link of Swiss File Knife on the top of this page to get more details about the vendor.